There was a slight change of cooking plans today. I decided to go from one of the most peasant dishes I know - I won't disclose the details about it just yet - to an Iberian inspired dish. As I was grocery shopping, while standing in front of the cheese section, I overheard a mother and her five year child speaking in a very distinct Castilian tongue. I knew then that today I was going to cook up something extra good. Spain is on the list of my top cusines. I feel a natural affinity to its culture , culinary tradition. It goes way back to antiquity for me. Some of my favorite Latin literature was hatched by many a pen of "Cives Romani", born and bread in Hispania, the name of the Roman province for the Iberian peninsula.. Any Marcus Valerius Martialis fans out there? So Spain was it and what better way to honor the country than by trying my hand at Paella. With a few twists of course. Paella was a very good idea. The last time I tried it, it simply did not live up to our expectations. It is true that the restaurant (shall remain nameless) had come highly recommended but not by me. It is also true that my search on yelp.com yielded so and so results. I should have paid a lot more attention about what the social networks buzz said. Yet on the very cold mid-December Saturday night , the fan club and I still decided to make the distant trek out to Queens, New York. So today, I just needed to avenge that lackluster experience and really cook up a dish to remember. So where's the drama in all of this ? Well , unpacking the monkfish I realized I had been monked! just monked by monkfish. The fillets were just not fresh enough. I rinsed, and re-rinsed, and took a good sniff. I was tempted to try the lemon juice trick. Nope, they failed the test. I asked the fan club for help. "Borderline fresh" they said. Nope, back in the bag and back to the store for a later refund. And by the way , I did get my money back around 5:00 PM. I was a bit annoyed that my dish could not be completed as intended. but the show must go on and so salmon became today's prime protagonist, a solo recital and it did good, real good. Indeed, I think that the dish turned out better that way. 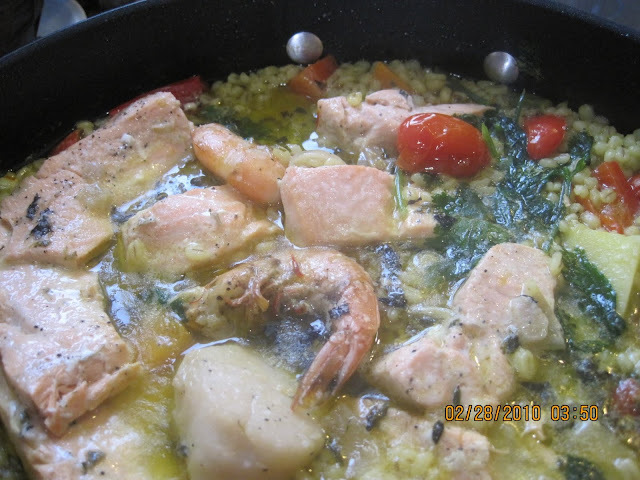 Paella is a multi-step dish. One should not be discouraged by this. I hear it too often. There are some short cuts that can help and bring the pleasure back to it.. For me, however, two steps or five steps, or even higher than that, just do not intimidate me. It's just part of cooking. The mise-en-place for this recipe will really help you out. Here are some tips for you. To reduce the cooking time for the dish, pre-soak your barley in two cups of hot boiling water. Treat it as if you were preparing bulgar wheat, except use a lot more water. After soaking the water will be tossed away. Then in a wide skillet , cook the barley half way through. It must remain al dente all the way up to the final assembly of the dish. Make sure that you do have two large, deep sided pans, identical in size. You will need them both. Pre-cut all the seafood and set aside. Pre-cut all the vegetables and set aside. Grado: When I mentioned that the remaining portions of the meal should be brought work, I got one of the horror flick, low frequency growlings: "Noooooo", the eerie voice said. The hair on my forearms bristled for a moment. Then I realized that the fan club must have really liked it. Folks, no sharing tomorrow. There are four steps to this. 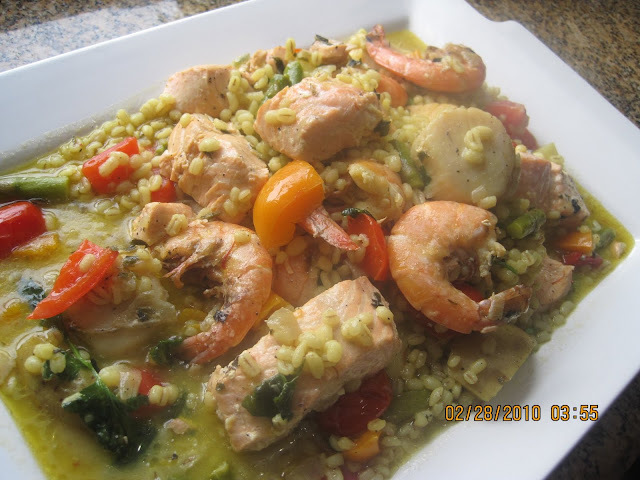 Cook the barley , cook the veggies, cook the seafood, mix and cook all parts together for a few more minutes. Pre-cooking the barley is the easiest. Add the soaked barley to a deep skillet , cook until 10 minutes, ensuring that is is very al dente. After cooking ,drain, and then set aside. Pre-cooking the veggies is also simple. Toss all veggies, sliced garlic, EVOO . Do not salt, Repeat , no not salt. Cook half way through, set aside leave in pan which will be used for the final preparation. No more than 5-10 minutes here. For seafood, preheat a large pan . Add EVOO, S/P, chopped garlic, shallots, and oregano. Cook for two or three minutes without browning on medium heat.. Add about 1/2 cup of water and white wine. Reduce for another minute or so. Add monkfish chunks. Cook one more minute Add scallops, then shrimp. Then add salmon. At this stage do not stir the seafood as the salmon will tend to disintegrate. Cook for a few minutes with a lid until the seafood is half way cooked. You can tell by the color of the salmon , and the color of the scallops. Turn off heat set aside. So far so good. Barley , check ! Veggies , check ! , Seafood check. Now Let's assemble this Iberian masterpiece. To veggie pan, add the barley and the saffron water plus some additional water. On low-medium heat. cook for two-three minutes. Then add the seafood using a large wide spoon. move the seafood to the pan with the veggies and barley. Add the all of the juices from the seafood pan. Add a few more tablespoons of EVOO - Don't be surprised by this, I'm Italian you know. Top with coarsely chopped cilantro, cook for another few minutes until the seafood has cooked through. Keeping the lid half way on will help keep the juices .Cook one last minute without a lid. Turn off the heat. Let the paella rest a few minute in the pan. Then gently plate on flatware, using a wide spoon. paying attention not to break up the fish chunks as they are removed from the pan. This dish became outstanding with a chilled glass of Vermentino di Sardegna, one of my favorite whites. Fresh crisp whites will really lighten things up. o quam saepe petet vina piperque cocus!